calibre sisaldab sisseehitatud e-raamatute võrdlemise tööriista, millega saab vaadata, mis pärast muutmist või teisendamist e-raamatus muutus. See suudab võrrelda EPUB- ja AZW3-formaadis raamatuid. To use it, either open the e-book in the tool for E-raamatute muutmine and then click File → Compare to other book or use the Raamatu üksikasjad panel. If you do a conversion from EPUB to EPUB, the original EPUB file will be saved as ORIGINAL_EPUB. Simply right click on the ORIGINAL_EPUB entry in the Book details panel and choose Compare to EPUB format. Avanev võrdlemise tööriist näeb välja nagu allolev ekraanipilt. See näitab sulle valitud raamatutes olevaid teksti, laadide ja piltide erinevusi. Võrdluse tääriist on kõige kasulikum, kui sul on samast raamatust kaks versiooni ja sa tahad näha, mille poolest need erinevad. Sel eesmärgil on tööriista käivitamiseks mitu moodust. Open the first file in the E-raamatute muutmine tool. Now click File → Compare to another book and choose the second file (it must be in the same format as the first). The comparison view will open with the file being edited on the right and the second file on the left. When you do a conversion in calibre from a FMT to itself, the original file is saved as ORIGINAL_FMT. You can see what was changed by the conversion, by right clicking on the ORIGINAL_FMT entry in the Raamatu üksikasjad panel in the main calibre window and selecting Compare to FMT. 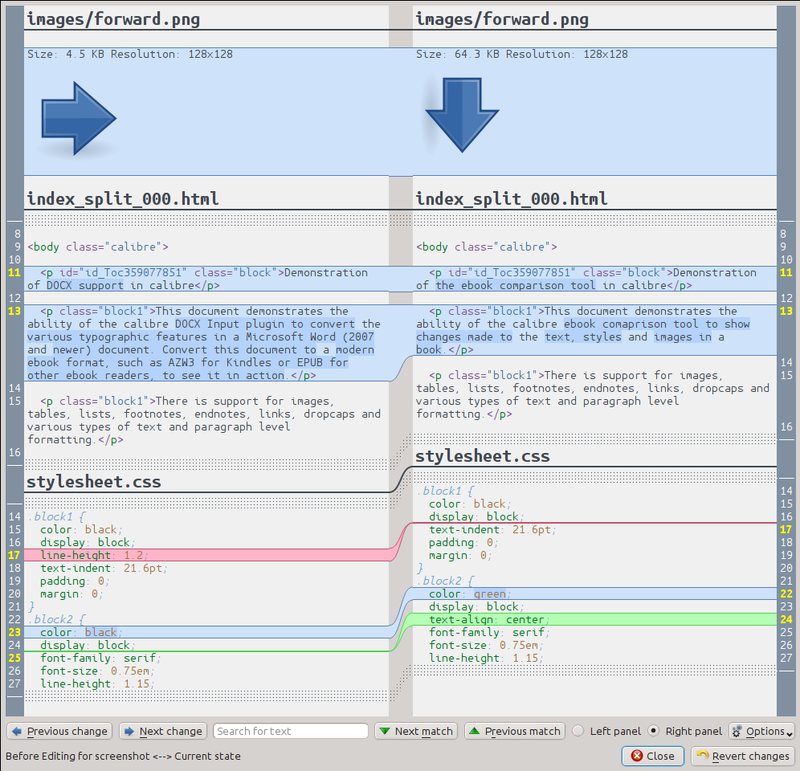 The comparison view will open with ORIGINAL_FMT on the left and FMT on the right. The E-raamatute muutmine tool has a very useful feature, called Kontrollpunktid. This allows you to save the current state of the book as a named checkpoint, to which you can revert if you do not like the changes you have made since creating the checkpoint. Checkpoints are also created automatically when you perform various automated actions in the editor. You can see the list of checkpoints by going to View → Checkpoints and then use the Compare button to compare the book at the selected checkpoint with the current state. The comparison tool will show the checkpoint on the left and the current state on the right.